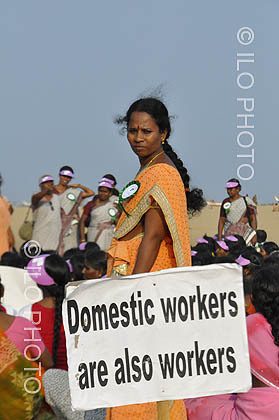 "Domestic work is one of the oldest and most important occupations for many women in many countries. It is linked to the global history of slavery, colonialism and other forms of servitude. In its contemporary manifestations, domestic work is a global phenomenon that perpetuates hierarchies based on race, ethnicity, indigenous status, caste and nationality. Care work in the household [...] is quite simply indispensable for the economy outside the household to function. The growing participation of women in the labour force, changes in the organization of work and the intensification of work, as well as the lack of policies reconciling work and family life, the decline of state provision of care services, the feminization of international migration and the ageing of societies have all increased the demand for care work in recent years."